Fire marshals do the investigation correct? But if foul play is being investigated wouldn't that bring in law enforcement? My brother in law is a fire inspector and is considered law enforcement, he carries a weapon and can make arrests related to arson investigations. Not sure if it works the same way in France. They didnt notice it when it was small, they didn't notice it when it was medium, they didnt notice it when it was large, they ONLY were able to detect it when it was a raging inferno that was impossible to put out. Happens all the time. It happened in my home town with a national landmark, look up St. Mark's church in West Orange. Almost identical damage and the fire was only detected until it was completely engaged. The evidence would've been all burnt up. If it was a hit, that Muslim extremist knocked it out of the park and with no claim from an organization yet. You'd think ISIS would have claimed it like they did with anything else that they could without proof as they were doing for a while. I guess their social media arm was cut off. I don't think a Catholic priest's sexual pedo victim turned outspoken or militant Atheist would've been able to pull this off, nor any renegade priests trying to destroy their evidence. That's a helluva fire to be able to start. Think of how it would have to start and become powerful enough to quickly spread like that. The weather such as wind will be taken into account, as well as electrical which would be the first place they'd look. It didn't start with anyone noticing it, that seems to be the case with no eyewitness or employee accounts of something going wrong in the kitchen or any facility. Intentionally pulling that off is very unlikely if it had to probably start from inside as the wood was basically encapsulated and surrounded by stone works. To do it somewhere inside without being noticed powerfully enough to cause that is extremely unlikely. From outside is almost impossible I'm assuming. Anyone taking credit for the fire? Right. I suppose someone took credit for all of these...and that's just a partial list. Pretty funny you think the absence of 'taking' credit is despositive of causation. Thing is, the police had reason to conclude that fire was the result of arson. 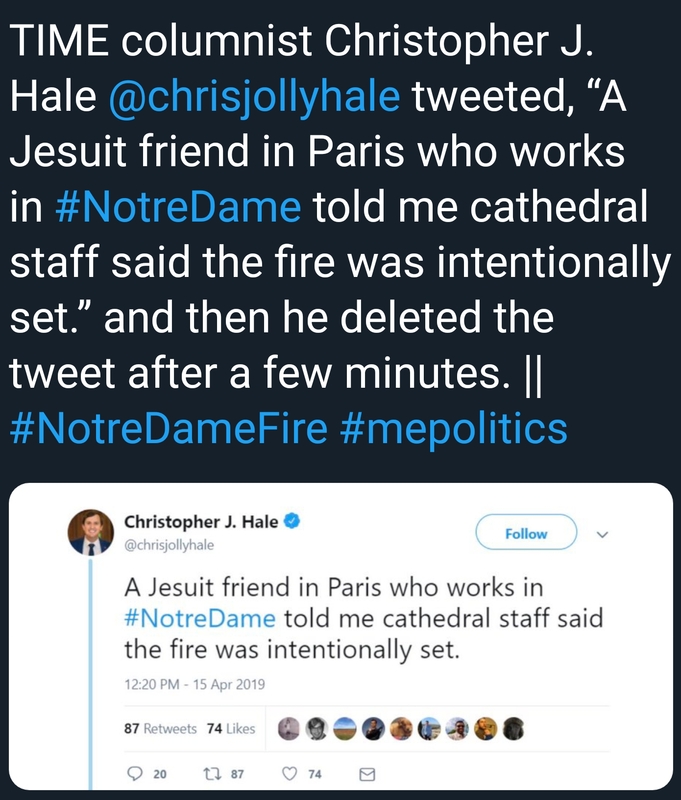 They apparently don't have reason to think the fire at Notre Dame was. According to initial analyzes, the origin of the fire is criminal, reports the weekly La Vie quoting LCI television channel. The motive and the identity of the suspect remain to be determined. The week before, an individual has already launched a piece of inflamed fabric on the facade, always according to LCI . Too early to tell, I would think. Just happened yesterday. Moreover, it's not like there isn't cause for concern. I would agree blaming the fire on an intentional act at this point is as speculative as saying it wasn't. Exactly! This is all just a big misunderstanding! The alarm went off, but the people trained for such things in the Nation with some of the most valuable real estate on Earth just couldn't find the fire. So, you think it was inside job, then. Not a Muslim extremist or terrorist group. Probably just some priests looking for an insurance payoff.